Quantum technologies hold the promise to go beyond the capabilities of classical present technologies by making use of pure quantum phenomenon, such as "entangled particles." 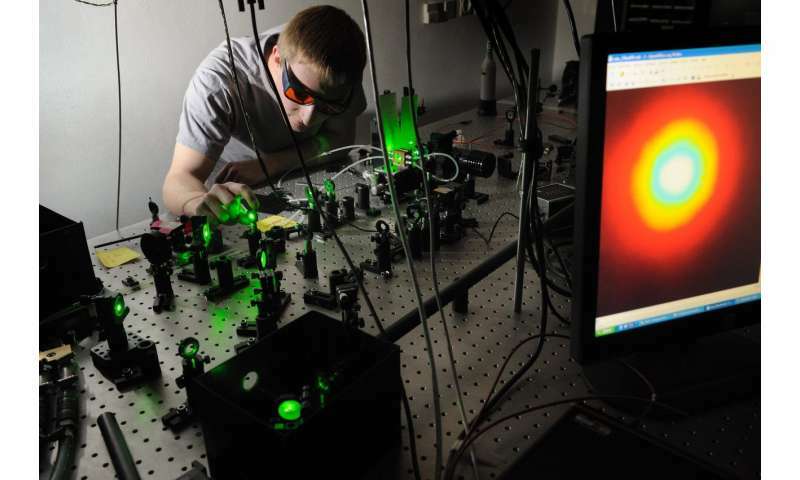 Quantum technologies are used in various applications, for example in quantum computers or in quantum sensing and metrology, which allows for imaging with higher resolution or determine more accurately properties of atoms and molecules. The entanglement of the photons is a so-called "energy-time entanglement," since the photons correlate with respect to both the emission time and the energy. Both correlations can be observed experimentally and allow conclusions to be drawn about each other. But since the researchers wanted to detect only the correlations in time of the photon pairs, they had to grab into their bag of tricks: "In order to form such pairs, we randomly shook the photons, so to speak," explains Dr. Stefan Lerch, lead author of the study. By doing that, the researchers induced a perturbation. "The more perturbation was added, the less did the photons behave in a quantum way." To change the quantum state of the photons, the researchers made use of techniques which are usually applied for the shaping of ultrashort laser pulses. "The know-how, that was developed at the University of Bern within the frame of the NCCR MUST was essential to achieve the precise control needed," notes study co-author Prof. Dr. André Stefanov. There is better troll bait in the link "New technique can capture images of ultrafast energy-time entangled photon pairs" right above the comment section. The artist's depiction explains it all quite simply. The problem is with the paradigm, in which the photon is a particle, and the inference to our understanding is that the crystal splits the particle into two particles which then become entangled, no matter how far apart they are. In fact, photons should not be construed as particles, but as wave fronts. No matter how far apart the photon detectors are, they are analyzing the same wave front, ergo the same photon. Therefore, a wave front of light arriving here from a star billions of light years away is the same wave front arriving in the other direction from us away from that star also billions of light years away. It is the same photon, and it can be observed to be "entangled", if two instruments far apart detect it at the same time. It is puzzling to me that mainstream physicists still regard photons as particles of light instead of wave fronts. That same radiating wave from that star described in my comment above spreads ever outward, but where are all those so-called photon particles coming from? The photon particles would need to be infinitely replicating as that wave spreads ever outward, but that is a violation of the first law of thermodynamics. So, not a particle. The author starts at "entanglement with correlation in time" (I thought entanglement was instant with no time invovled), then pivots to using lasers, then again pivots to spectroscopy without any explanation of what it means. This all seems like a lot of smoke and mirrors. I under stand what you are saying about the same wavefront. It makes sense. So there is really no entanglement. But in these experiments , Bob and Alice would need to be exactly the same distance from the photon source. I would doubt that the two receiver instruments would be exactly the same radius away from the source.